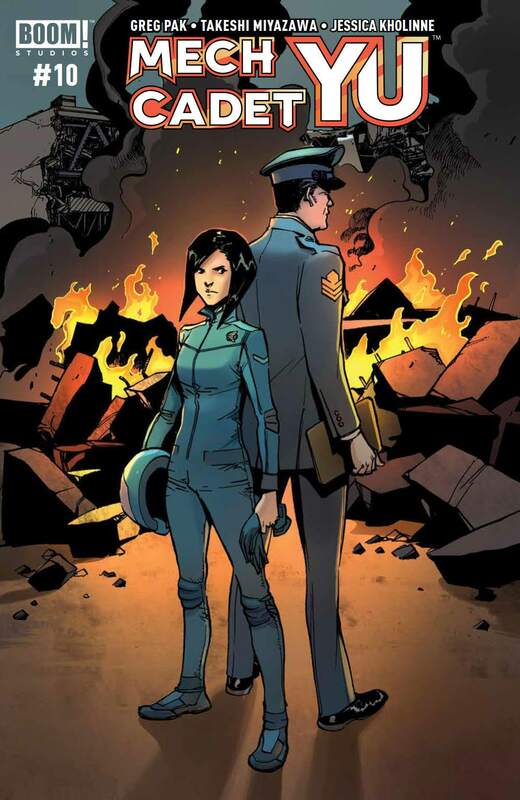 Mech Cadet Yu #10 Review – AiPT! The supporting cast steps out of the shadows and into the spotlight. When it comes to heartwarming comics that channel classic cartoon fun while feeling fresh and innovative, one title stands out on top: Mech Cadet Yu. The BOOM! Studios series is approaching its end, and this month’s issue is the third last. Last month’s issue ended by hinting at the possibility of Buddy sacrificing himself, but does that actually come to pass? What twists have the creative team delivered this time around? Is Mech Cadet Yu #10 good? Yu and Buddy’s bond has been the emotional core of the series since its inception, and it continues to steer the drama here. Before flying down to Earth to sacrifice himself, Buddy shows Yu and the other cadets footage taken from his memory banks. These memories all revolve around Yu, and the other characters comment on how much the pair learned as a result of their friendship. It’s a touching moment that really sends home how shocking and potentially devastating the idea of Buddy’s death is. Writer Greg Pak has done a good job building up characters’ relationships throughout the series, and his efforts pay off here. With that said, this issue’s best character moments aren’t limited to just Buddy and Yu. The most startling development comes from Olivia, who makes a potentially self-sacrificial decision in order to save Yu’s life. Olivia and Buddy’s fates haven’t been revealed yet, but seeing them step up the way they have is impressive. Olivia started out as a somewhat generic rival character to Yu, and Buddy hasn’t gotten many shining moments in the last half of the series. Now, though, they’re pushing beyond their previous limitations to become dynamic heroes in their own right. Yu’s mother also has a great moment in this issue where she tells him to do what is right instead of following General Park’s orders. The catch is that General Park is in the room as she says this. Even this series’s supporting characters get crowning moments of badassery, and I love it. There are a few transitions with slightly wonky pacing, but other than that I have no complaints with the issue’s writing. Visually speaking, this issue is good but not the series’s best. Takeshi Miyaawa is a skilled artist, and while his line-work is never bad here, there are definitely panels that look more rushed than his usual work. The characters are never lacking in detail to an extreme degree; they just don’t always have quite the same level of charm as in previous issues. With that said, the page compositions are still fantastic. There are several particularly impressive splash pages during action scenes, and they do a good job emphasizing pivotal moments. The coloration and lettering here are also solid. Jessica Kholinne took over as the series’s colorist last issue, and she’s been delivering good work. Her skylines are particularly pleasing to look at, with bright blue expanses and gradual shifts in color. My only complaint with the coloration is that there are some close-ups on characters’ faces that use fairly flat coloring where more detailed variation could have been beneficial. Nonetheless, the issue looks great throughout. This is also thanks to Simon Bowland’s letters, which are flawless as always. Overall, Mech Cadet Yu #10 is an enjoyable issue. Several less developed characters get time to shine, and the development Buddy and Yu have gotten prior to now pays off very well. The artwork is also strong throughout, with solid composition and coloration. My main qualms are with occasional wonky pacing and slightly rushed-looking line-work, but neither of these things are outright bad. This series may be ending soon, but the creative team has yet to lift their feet off the gas. Effective character work and lovely art make this yet another enjoyable issue.